Millennial Media: Good luck, and thanks for all the fish! Disclosure: I know tons of people at Millennial and am good friends with many of them. And I hope they all make crazy bank. Anyway, I haven’t talked to anyone there since the S-1 filing and I am not an employee, so I can complain about the coverage that Millennial is getting from the Business Insider. They have written a couple of articles that I take exception with. Also, Business Insider is a rag and I wish I could stop reading it. Finally, I have been wanting to do a blog post about Millennial’s IPO and how their Q4 was probably boffo. I think the URL says it all: Millennial Media’s IPO is dependent on accounting gimmicks. Business Insider is dismayed that that an ad network recognizes dollars that pass through as revenue and then the publisher payments as COGS. Although they note that this is how every ad network does it. But folks, this IPO is not about small revenue – although I actually agree: The revenue is smaller than I expected. This IPO is a growth story and a story of needing cash. Historically, networks have a negative cash cycle. Publishers expect to get paid by networks quickly and agencies pay slowly. The result is that you need a lot of cash to front the business. 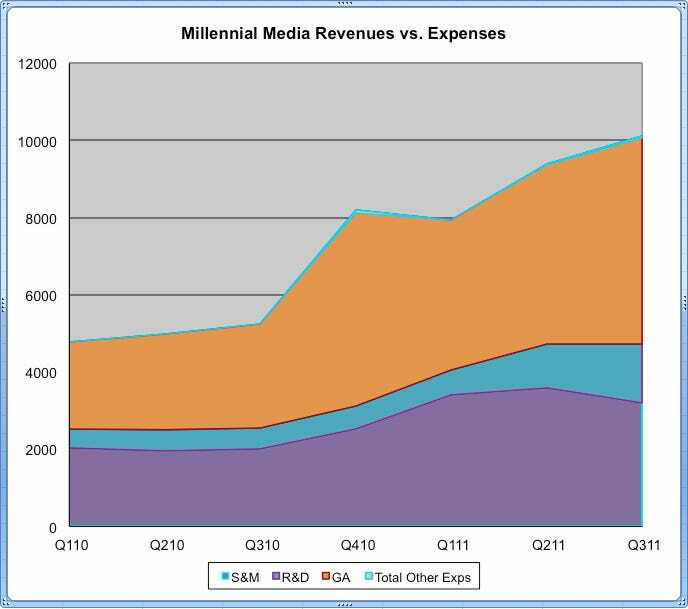 But let’s talk about the growth story: In 2010 Millennial did 40% of their revenue in Q4. I expect more of the same and a key part of their IPO is putting the puck on the ice with a great announcement in a few weeks – immediately prior to their IPO – about a blowout Q4. How do I know this? This business is seasonal. Q4 is when it happens. You saw it in 2010. I had a great Q4. Q4 was great for mobile advertising – I have seen a number of anecdotal industry data points. Millennial knows what they are doing. These are the same guys that hit it out of the park at Ad.com and they ran that business with strong operations. I am telling you right now: They know exactly how much money they make every day. When they filed their S-1 in the beginning of January, they already knew what Q4 was and they filed knowing they were going to have a great announcement to make prior to the IPO. They know. Their bankers know. This is orchestrated. What is that problem? Let’s quote. This ought to be CEO Paul Palmieri’s No.1 issue right now: Controlling his bloated admin costs. If Palmieri (pictured at top) can’t get those down as a portion of gross profit then it doesn’t matter how successful his salesforce is. This is pretty much 10000000% wrong. The hypothesis that a business needs to cut these costs imply that a business is mature. Millennial’s plan is not to control costs to generate profits. It is to grow. GROW. GROW. This is the Amazon model. If you want to win, you spend. They will grow their way to profitability, but Business Insider talks out of both sides of their mouth: This company is tiny! This company has bloated admin! What no one can deny is that they are growing super fast. They could be 10x bigger in 4 years. Bet they will throw off tons of cash then. When you raise money and when you build a business, people always need to be thinking about optimal velocity. This spend is about maximizing market opportunity, not maximizing quarterly profits. That will come soon enough! Did they hire people to work in Publisher Services and lock up tons of inventory for Q4? Yep. Did they scale up operations like crazy? Yep. Did they hire finance people to get all SOX-compliant? Probably. My understanding is the business is swarming with finance people now. Is this a bad idea? Nope. It is the top of the first inning. They have a chance to be a dominant player in the industry. Why would you underinvest? They are going after it. That is totally the right thing to do. In a market like this, you grow your way to profits. Skimping on the business is a recipe for disaster. Why Business Insider would encourage this demonstrates their naivety toward the opportunity in mobile advertising. This entry was posted on Wednesday, January 18th, 2012 at 2:10 pm	and is filed under Corporate Strategy, Online Advertising. You can follow any responses to this entry through the RSS 2.0 feed. Both comments and pings are currently closed.